Paris, France in the Autumn is such a beautiful sight to behold. 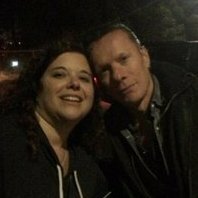 The #U2ieTour has arrived, and this week the Zoo spoke to Judith from French U2 fan site U2Achtung. Bonjour les amis ! We are very happy to have the opportunity to present our French website and community to the Zootopians. U2Achtung was created 15 years ago in 2000 by Bert, Coco and Fab. The team members have changed a lot over the years, people joined and left, but today, the U2Achtung team is made up of Judith, Nadine, Antoine, Benjamin, Florian, Loïc and Matthieu. We are from France, Belgium and Switzerland, but our community is open worldwide, even if we focus on the French speaking fans. Many people have helped, too many to mention, and we thank them very much. Without them, we are nothing. Like other websites in different countries, we provide daily news for our followers about U2, their music, tours and projects. Visitors are also able to find a very rich content about U2 releases, biography, videography and bibliography too. We even translate their lyrics in French. 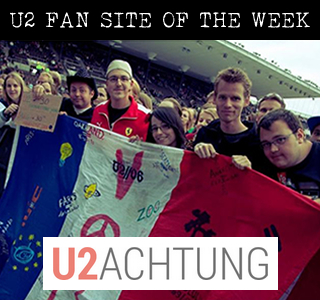 On U2Achtung.com, there are two main areas: a chat forum (in a free section) with over 12,000 members, and the Club U2Achtung (annual subscription access). Almost every year, we organise a cover contest that we call “Achtung Awards”. It takes place on a dedicated web page of ours and people vote for their favourites. It is a very interesting way to discover new talents among our community, but also to hear some amazing work done on U2 songs, that sounds really professional. It could nearly be on an official U2 Remix CD! It’s open to every musician, and on our last edition, we even had foreigners taking part, who we helped going through the French website. And as we like to work for the fans and U2, we created two mini websites for the big anniversaries of War (30) and Achtung Baby (20). You should take a look, we think our web designer did something great! Over the years, U2Achtung has managed to create strong links with the fans and the record label, so that we organised many events and special occasions. One of the first big fan event in France was the Zoo TV DVD screening at the famous Paris venue “L’Olympia”, in the presence of Michka Assayas, author of Bono par Bono. Our website had invitations to give away for that memorable night. The writer even tried to call Bono in front of everyone, but only got the answerphone. We also managed to get two members of the team to an exclusive listening of No Line on the Horizon in 2009, and we offered tickets twice for a TV show (Le Grand Journal) in 2009 and 2014 where U2 were the musical guests. We even more recently gave away 2 tickets for the Dublin shows in November! A lot is happening within our community, especially through our forum where people can chat, trade tickets, plan trips together to see U2 abroad and meet even when there is no tour. And when there is no U2 activity, people talk about other bands, cinema, their jobs, etc. For many of them, it’s really a part of their daily life. And it’s also a place where friendships were born, have grown and where love stories started, leading to some marriages and U2Achtung babies. 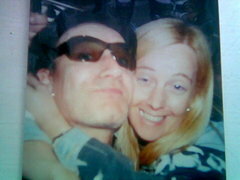 Every fan knows that U2 loves France, they always spend a few weeks or months here, in the South. And France loves U2 as well. We showed them this never-ending love and passion on several occasions, like in Stade de France in 2005 with the “White Balloons” initiative, which we repeated in 2010. It was a success and the band publicly said in 2005 that it was an amazing surprise. Now with the 4 U2 shows in Paris this week, we couldn’t be more excited to have U2 back here, especially in arenas, 14 years after the Elevation Tour. For this occasion, we designed an original T-shirt, available through our website. You may bump into fans wearing those t-shirts in Paris. And also, as it’s always a celebration when U2 comes to France, we are going to throw a party on November 13th at Pub O'Connells in Paris, with the help of Universal Music France and French radio Oui FM. Fans from all over the world will be able to meet, dring, sing along watching lives and win more gifts! See you soon in Paris!!! C'est parti ! "I'm Paris", "Je suis Paris"